If you follow me on Instagram, you know that my Marcelle Medallion quilt top has been in the works for sometime now, and that I am in love with it. This is the first quilt I have made that is going to be all mine! No sharing for this mama.... Well let's be honest, I'll probably share. I started it last September during the MMQAL over at Penny Poppleton. I did pretty well keeping up the pace with the quilt along, but then I fell behind and hit a wall (aka the flying geese). From that point on, I only worked on it here and there, and didn't really push to get it finished. Finally after the new year, I ordered all the fabric I needed to finish it up (thanks mom) and got back to work. It is by no means perfect... my geese are too big, several of my seams aren't quite square, and I am pretty sure it ended up a couple inches bigger than what the pattern states. But hey I don't care, it's a labor of love and I love it.... hey did I mention I love this quilt. For most the blues in my quilt, I used my horded I mean stashed collection of Constellations by Lizzy House. It is a fantastic line, and I am so glad I discovered it while I could still get a complete bundle of it. I still have a full FQ bundle waiting for another project. I also used some Tula Pink fabrics from my stash and other various blues that I felt worked overall. Oh and of course tons of Pearl Bracelets, plus all the backgrounds are various low volume prints from my stash. 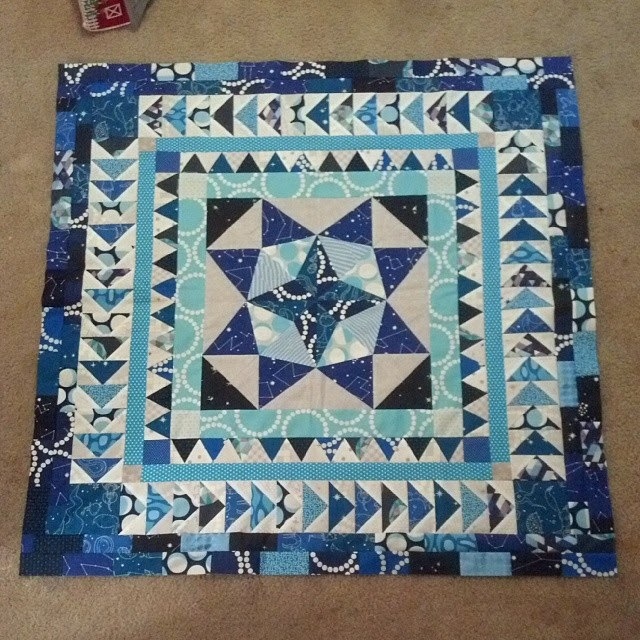 These blue jewels (also Lizzy House) that I used for the outer border were exactly what I was wanting. I love the way that the darkness of it closes off the quilt and says yep it's done. I've seen soo many Marcelle Medallions that go on and on with extra borders, and they are gorgeous, but I like that mine has a definite end. I feel like any other color would have left me thinking there is something missing. I wanted it to be scrappy but not un-cohesively scrappy. Some scrap quilts leave me a little lost, and a bit over stimulated, so I like that the monochromatic nature of this lets it be scrappy without being overwhelming. In making this quilt I've discovered that blue is definitely my safety color, and that I love saturated colors over pastels and soft hues. Finishing this quilt top was my goal for the January A Lovely Year of Finishes, and I am so glad that I was able to accomplish it. Now the challenging part for me... quilting it! I have a couple ideas, and I am looking forward to trying them out. Oh and I just had to share these adorable pictures of my little William that I took while taking quilt pictures :) He loves having his picture taken and it makes me smile everytime! He's looking more and more like his daddy every day! I love this sweater my Grammo got him for Christmas. Who is this little boy, and what happened to my baby! Love him :) He's going to be the one that fights for my Marcelle Medallion. Tonight he wouldn't go to bed with any of his other blankets because he only wanted a quilt I had made him (his was in the laundry from an accident last night). Thankfully I had his baby quilt I made him when he was a newborn, and he happily took it even though it is too small for him now. The other night after I finished my Marcelle Medallion (pictures coming soon) I sat down and thought of every craft/sewing project I have in the works, and made a master list of unfinished items. I am a bit embarassed that it has 20 things on it! I honestly didn't think it was that many haha. FYI I am counting project that have fabric pulls and patterns as WIP's; most of the garments fall into this category. So from this point on (I'll probably break this rule) I am not going to start any other projects without first finishing some from my WIP list. I think A Lovely Year of Finishes and the 2014 Finish Along will be great motivators for this. I work better with set deadlines or goals. So there it is! I'm looking forward to getting some of these things finished up and being able to add some new things into the mix. I seriously need to control my sewing ADHD haha. How many projects have y'all had in the works all at once? It's that time again and I am getting close to my deadline for my 25 by 25 goals. Here is how I am doing so far. Finally lose those 10lbs that have been hanging on since having William. I've been doing yoga every other day in the evenings, and today I am starting this workout. Hopefully it will help me achieve #10. If you use My Fitness Pal or RunKeeper, add me as a friend and we can cheer for each other! Complete 10 quilts (binding & all). I'm still at 5 quilts, but I just finished my Marcelle Medallion quilt top. William's quilt, the Grandma's Lawnchair quilt, and Peyton's Car seat quilt, Schnitzel & Boo Mini Quilt Swap, and an Etsy order. I'm halfway to my goal! Start making significant & consistent money from my Etsy shop. I'm holding steady at 3 times so far! Go camping as a family. Go to the beach as a family. I'm hoping to head to Galveston or Corpus Christi sometime soon. Balance our finances and stick to a budget. Grow my blog to at least 300 followers. I made it to 301 followers! GFC & Bloglovin combined. Thank y'all so much for following along with my crafty journey!! Keep in touch with my girlfriends more. Save money and upgrade my camera to a DSLR. Visit a state I have never been to before. Bake soft pretzels from scratch. Planning on making these for our Super Bowl party on Sunday! Get a family portrait taken. Start planning a wedding. This one hinges on Jeff's decision to make us "official". Have a pattern published in a Magazine or Moda Bake Shop. I'm doing something special for an awesome site :) I'll share more about it soon! Read at least 25 books. 5 down, 20 to go! I've started counting quilting books and such to the tally. Check out my Good Reads. Read to William more consistently. Have an organized meal plan each week. I don't always have exactly what we're having scheduled each night, but I shop for a weeks worth of meals when I go to the grocery store.It has worked out great and I find I buy less junk at the store now. Teach William how to do age appropriate chores. He loves helping with the laundry and dishes, and is getting so much better at picking up his toys when he's done playing with them. Visit my brother more often. Now that he is a stay-at-home dad, we hang out all the time! Open a savings account for William, and start saving for college. Finish William's 1st year scrapbook. Make The Weekender Bag & The Aeroplane Bag. My awesome friend Kristan and I got together and made Aeroplane Bags while our little ones played. It was awesome and I love having a friend who loves the same things I do! I am so happy to say that I have finished my Aeroplane bag! I started working on it on the 10th with my awesome friend Kristan, and I finished it last night at almost midnight. 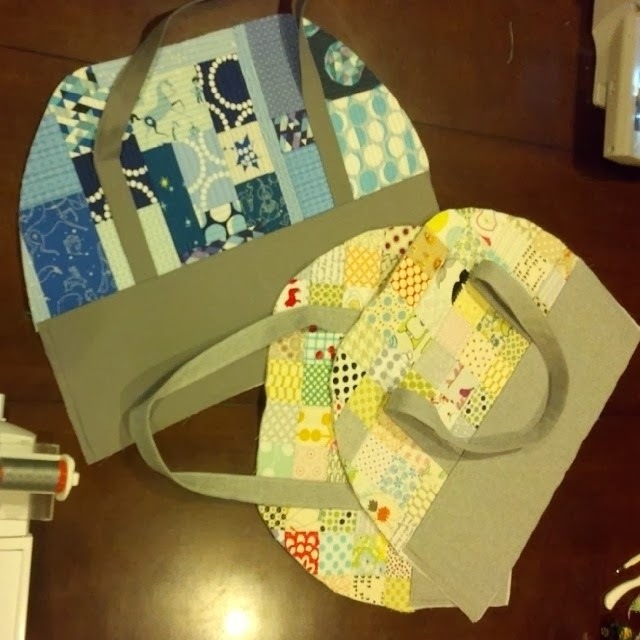 The fabrics I used are a bunch of blue and grey scraps from my Marcelle Medallion quilt. Mostly Lizzy House Constellations & Pearl Bracelets with a couple Tula Pink Birds & Bees prints. The grey is a canvas that I picked up at Joann's. I used the quilt as you go technique to piece the main panels of the bag an I really love how they turned out. 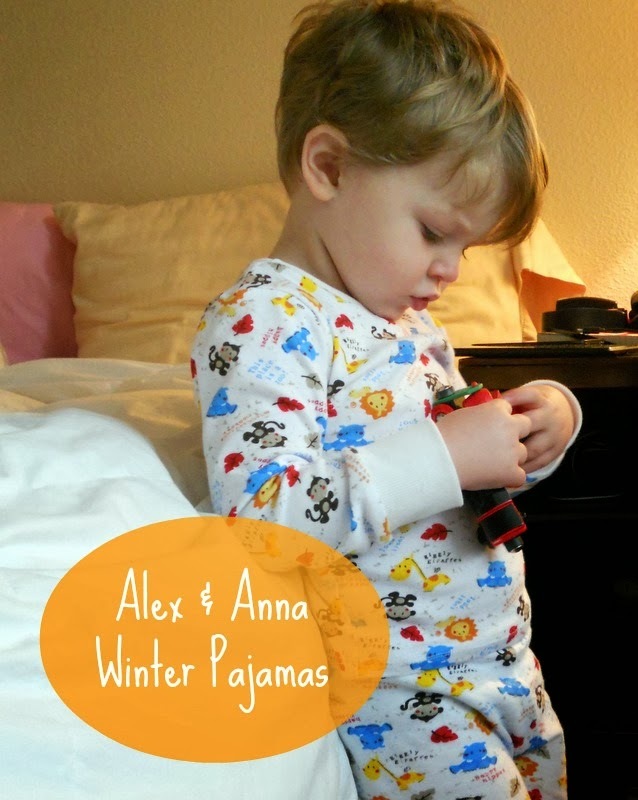 I used this post from Oh, Fransson! as a reference. What I didn't love was the amount of time it took to make each panel (probably 2-3 hours for each, if I factored in cutting and obsessing about where to place fabrics). I quilted the panels with a gorgeous blue Aurifil Thread #4140 it blended just enough with the darker fabrics, and stands out beautifully on the lighter ones. If I make the bag again I think I will try and do the zipper a different way. I'm not a huge fan of how it goes into one side and isn't centered. This bag is huge! (dimensions from the pattern: Long 18-1/2” x 14-1/2” tall x 8-1/2” deep) I could easily use it for a long weekend getaway, and I can even fit my sewing machine inside with all her goodies. I already know I want to use this for the HMQG retreat in May. I added a magnetic snap pocket to one side of the bag and I am so proud of myself haha. I have never used a magnetic snap before and I was worried it was going to be difficult to install but it wasn't. Also I fussy cut some cuteness for this bag... just check out that adorable fox up by the zipper. What was difficult was the darn zipper. I don't even want to begin to tell you the number of expletives that were spewed while sewing that bad boy in. I'm just happy little William was asleep while I was cursing up a storm. The lining is a gorgeous DS Quilts print that I picked up at my local Joann's. I love using light colored fabrics for bag linings because I find it easier to find things in the bottom of the bag. The pattern calls for 2 zippered pockets on the inside, but I ended up only putting one. I toyed with putting normal slip pockets but I decided against it because I was tired last night and just wanted to get this baby finished! I think I might go back and tack the lining to the corners of the bag because it is a bit droopy on the inside, but that could be because I also skipped interfacing the lining because I ran out of Shapeflex. One of my favorite parts about the bag is this little star that I pieced for one of the panels. It finishes at 3" square and it was fun but difficult to make. Those 1.5" unfinished wonky star points were interesting to say the least. The zipper installation is going to feel wrong, but it works in the end. There are lots of pictures and detailed instructions for every step. The long size is huge! If you have been looking for an awesome bag to make I definitely recommend making this one, and if you do I would love to see it! I debated on whether or not I should join the FAL 2014, but the way I see it more motivation to get things done and WIPs crossed off my to-do list is a great thing! Here is the list of things I am looking to finish between now and the end of Q1. My Marcelle Medallion. I have a couple more borders to sew on and then the top will be done, and then I can tackle quilting it! My sister's quilt is about 45% quilted. I am doing vertical straight line quilting and it is taking soooo long, but I am loving the look of it! William's cross-stitch. 2 weeks before I had William, I told Jeff I Was going to finish this before W was born... well W decided to show up the next day and 2 years later it still isn't finished haha. All I have left to do is the details and to get it framed. Aeroplane Bag. Mine is the blue one and the low volume one was made by my awesome friend Kristan. I am loving how it is coming together but the QAYG aspect is taking forever! My mom's curtains. I don't have a picture of these but I am making my mom some curtains for her living room. Each panel is 10 yards long! They have been a beast to work with but I know they will look awesome when I finally finish them. Well I made up a list the other night of all the things I have in progress and I am kinda ashamed that it is soooo long, haha I really need to get it under control. Plus as I am writing this, I have remembered a couple things I forgot to add to the list. Once I finally get everything tallied up I Will share it with y'all. Tiny star and wonky stitching. One day I will have perfectly straight straight line stitching. We're making the Aeroplane Bag by Sarah over at Sew Sweetness. Kristan's is making the regular size with some gorgeous low volume fabrics, and mine is the long version and I am using most of my Marcelle Medallion scraps. I'm making the panels using the Quilt as You Go method and I am loving it, but it takes forever, but I think it will pay off in the long run. I found this tutorial from Oh, Fransson! to be really helpful with the QAYG panels. I am hoping to get this finished up before the HMQG meeting this Saturday. Wish me luck! When I first taught myself how to sew, I did it with a beginner skirt pattern from Wal-Mart and some super cheap fabric. It was the ugliest thing ever and I did tons of things wrong while constructing it, but I loved it because I had made it for myself. That was almost 10 years ago! I've sewn other garments for myself since then, but they have always been either a big hit or a big miss. The last time I sewed a garment for myself was almost a year ago and it turned out eh, leaving me less than in love with garment sewing. Most of the store bought clothes in my closet I could honestly live without, and finding an entire "outfit" is practically impossible. Plus on top of that, I pretty much hate shopping for clothes. Plus, on top of that, I've almost always found that anything I have made for myself makes me look like a 12 year old, which is less than ideal. But after reading this post from Sarai over at Colleterie, I've started thinking more and more seriously about really making stuff for me not just garments that I can wear. She invites us to work to build wardrobes that reflect each of us, and be the architects of our own wardrobe. Each week she will have a post that will help us become more involved with our own style, but not in a snobby fashion guru sense, but more in a self discovery type of situation. "Let’s think about form and function, the deeper implications of our choices, how clothing reflects each of our identities, and how we can sew more and buy less." I'm really looking forward to this little series, and doing a bit more selfish sewing :) But don't worry all my quilting friends out there! 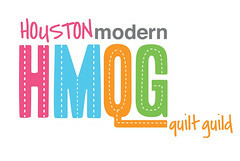 I will still have plenty of quilty goodness to share along the way too. Well my household started off 2014 in a very lazy way. We finally had Christmas with Jeff's family and watched tons of college football. By the time we got home Jeff was exhausted and went to bed, and W and I are now watching Curious George. As I sit here and watch Curious George's silly antics I start to think of the things I want to accomplish in the coming year. George does some pretty exciting things, and in an odd way it is inspiring. My biggest thing that I want to accomplish is being more confident in myself and skills. I tend to get caught up in my own mind and think that my stuff might not be good enough, but so far I have always been able to shake off that notion and trudge on. Practice makes perfect, right? Make 1 quilt a month. Design a quilt pattern on my own & make it for the first time. Don't spread myself too thin and ignore other aspects of my life. I can get caught up in sewing, and not sleep enough or play with W enough and I hate that. I need to learn when to walk away and know that I'm not going to miss an opportunity because of it. Enjoy what I do. I sew and quilt because I love it and I don't ever want it to feel like a chore or something I have to do. Well that is my list of challenges and goals for myself. I am looking forward to what this year has in store, and I can't wait to share it all with y'all!